Joining the creative team behind the multi-award winning The Game Before The Game, Beats By Dre's global integrated Rugby World Cup campaign built on the success of the Football World Cup film with a full 360oC approach incorporating TVC, Editorial, Social and Digital content with world famous athletes from the RWC's three key teams: England, France and New Zealand. Within two weeks over 16 million people on YouTube alone watched the story of Rugby heroes' pregame and the challenges they face gearing up to represent a nation. Our lead TVC films were activated across the web with a full suite of editorial pieces. Alongside intimate interviews with Chris Robshaw, Wesley Fofana and Riche McCaw, we branched out of sport and into music & culture; partnering with SBTV to create a special one off grime cypher, featuring the cream of 2015 UK Grime scene, and making a series of cooking shows featuring French player Sebastien Chabal. 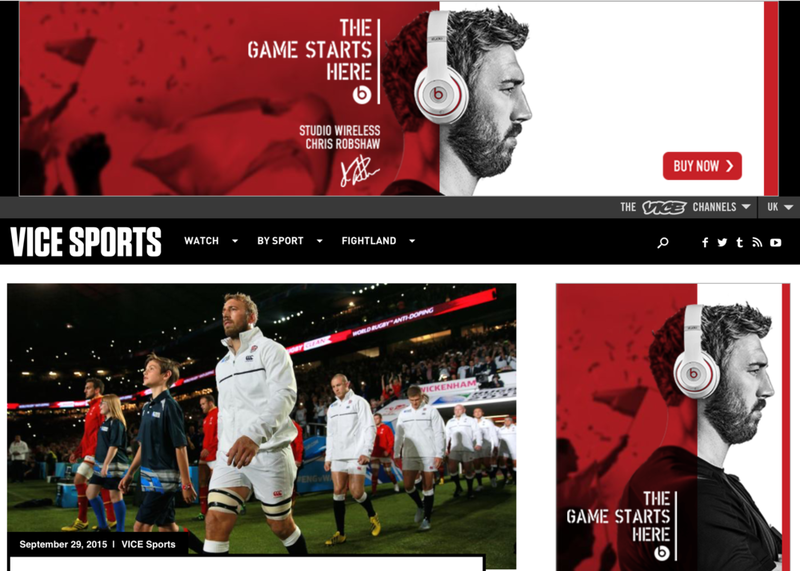 Our partnership with Vice Sport gave #TheGameStartsHere a platform to comment and engage with the tournament at a deeper level, with specially commissioned articles from sports writers on a range of rugby world cup topics, which all lead back to the TVC and into the Beats By Dre ecosystem. Our reactive campaign sustained interest across the full six weeks of the tournament. Activities included reactive posts responding to outcomes of individual matches, special 'VS' edits facing off key players before they entered key matches, and a Twitter take over from professional player Rhys Webb during Australia Vs Wales. We also celebrated the World Cup final in Times Square, home to the world's largest billboard.